Haltom City Parks & Recreation maintains two spraygrounds...one at Broadway Park (4839 Broadway Ave.) and the other at Whites Branch Park (5290 Western Center Blvd.). Both locations are mapped below. For more information call the Parks & Recreation Department at 817-831-6464. 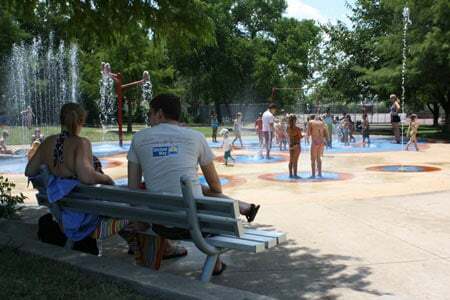 The spraygrounds at Broadway Park and Whites Branch Park are in operation from Memorial Day to Labor Day. Hours of operation are 10:00 a.m. to 8:00 p.m., seven days a week. Hours will be subject to change due to water restrictions, weather, or unforeseen repairs. We hope you enjoy this refreshing summer activity!